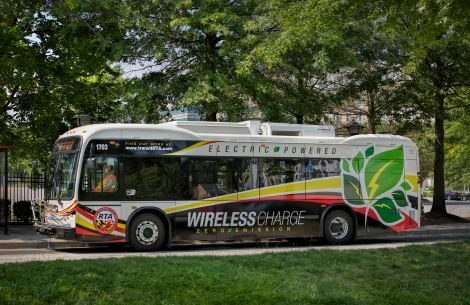 Zero emission electrified bus transportation is coming to Howard County with the advent of fully electric buses powered by wireless charging technology from Momentum Dynamics Corporation. The project is the result of a cooperative effort between Howard County, MD, Regional Transportation Agency of Central Maryland (RTA), Maryland Transit Administration (MTA), BYD North America, Center for Transportation and the Environment (CTE), and GGP. The project team has recently completed the installation of a state-of-the art inductive charging system at The Mall in Columbia. Three new electric buses will be wirelessly charged when they make routine stops at the Mall. The Momentum® charger operates at efficiencies that exceed many conductive chargers, and does not require a chilling system, nor the regular expensive maintenance of an overhead charging system. The Federal Department of Transportation (DOT) provided funding through the Maryland Transportation Administration (MTA) to Howard County. The funding supported the purchase of three 35-foot (32-seat) electric buses from BYD Coach and Bus, as well as the inductive charging equipment from Momentum Dynamics.